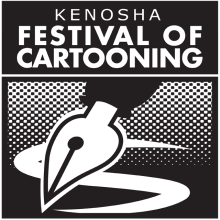 Kleefeld on Comics: On Strips: Go to Kenosha! Go to Kenosha, WI this weekend if you can. Today, John Hambrock and Jen Sorensen are speaking at 6:30. Tomorrow, Rob Harrell, Eddie Pittman, Wiley Miller, and Ann Telnaes will be there. At the Kenosha Public Museum there's an exhibit called "Bending The Lines: Women Of Cartooning" featuring original art from: Donna Barr, June Brigman, Edwina Dumm, Ramona Fradon, Dale Messick, Rina Piccolo, Wendy Pini, Trina Robbins, and many more! I've wanted to go to this festival since I first heard of it several years ago and, after this weekend, it will be going on hiatus until 2019! So don't dally! It's only an hour's drive from Chicago! Get there if you can!